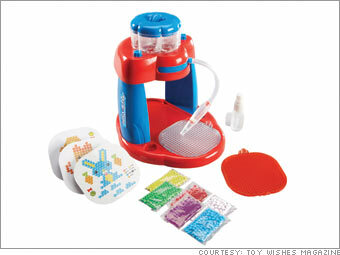 The Consumer Product Safety Commission and Spin Master recalled 4.2 million Aqua Dots toys on Nov. 7 after tests found the toys contained a chemical that caused some children to vomit and become comatose after swallowing them. Toys Wishes magazine call this "one of the most innovative activity sets" to hit the market in a long time. Kids can use the translucent, multicolored beads to create cool designs, or they can follow the templates to make their own patterns. After the design is complete, spray with water and the dots seem to magically adhere.